Not every adventure awaits within a sealed tomb or mad wizard's tower. In seemingly civilized cities, dangers lurk down every twisting alley, and backroom deals might spell the end for nosy investigators. 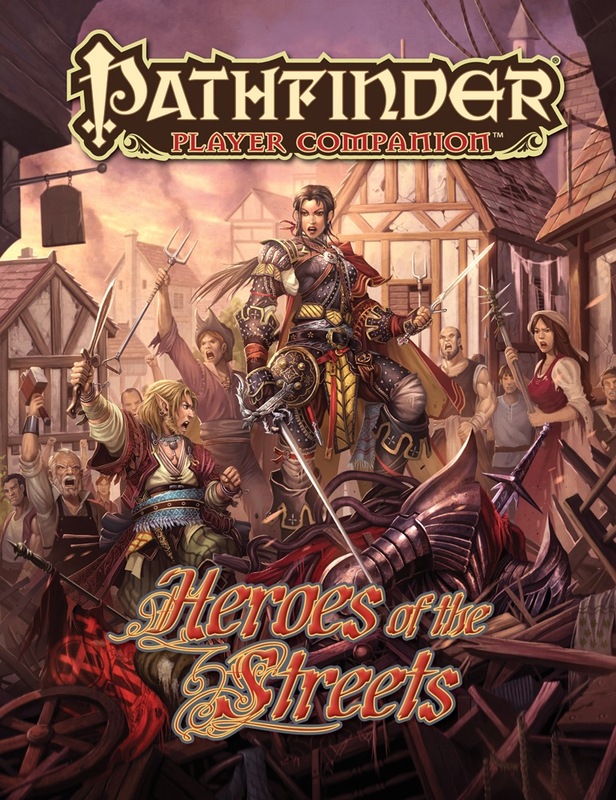 Pathfinder Player Companion: Heroes of the Streets provides the resources to take your Pathfinder RPG character from a dungeon-delver to a witty and backstabbing urbanite. Background suggestions and traits for heroes of every race who hail from Golarion's biggest and oldest cities. New archetypes that bring bloodragers, hunters, skalds, and witches out of the wilderness and into the city. Exceptional gear and magic items especially suited for urban intrigue, underhanded espionage, and despicable crimes. Optional subdomains focused on city life and urban challenges, opening up unique powers and expertises to clerics and inquisitors. New spells especially suited to getting by in the bustling streets and back alleys of your favorite metropolis. So far this is my favorite entry in the entire Player Companion line. I'm running Hell's Rebels right now, so I got this for my players. I immediately fell in love with the book. The flavor is exactly the right tone, pace, and level of detail for my players. Every single piece of crunch is something which is just powerful enough that people want to use it, without any one item seeming OP (at least as far as I can tell). But most importantly, all of the crunch feels very flavorful. 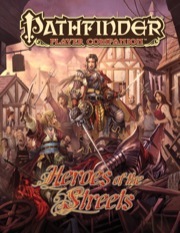 If you are in a campaign which involves any amount of urban adventuring, this is a must have. If your campaign has no urban campaigning, this book will make you want to book it for the nearest city. Announced! Product image and description not final. I hope this has plenty of Bard support. This better be followed up by Villains of the Sheets. Ugh, fine. Villains of the "Curtains". ...but a freak in the bed! I said, YEAH! But seriously I'll be disappointed if this book does not have urban fantasy slang terms. Between Dirty Tactics and this one, there should be a lot of urban adventure support for the Hell's Rebels AP! I'm running my first totally city based campaign and this would be a great help. Why has this and other books (like the Dirty Tricks one) shown up on the product page yet? Honestly, I'm much more hoping they try to focus on most of the other classes that do not so easily fit in a "street" level game. Something along the lines of the Urban Druid/Ranger/Barbarian for classes like Cleric and Monk, maybe a Cavalier that focuses on personal security for in coming merchants/caravans. Really don't need anything the more obvious classes like Bard and Rogue, who already play well, (best) in urban and street settings. Shouldn't this show in the PF Companion page? I want a Flash Mob teamwork feat, and the Shaft prestige class. The streetwalker archetype while appreciated may not be palatable. Need more Rogue, Investigator, Brawler and things like Urban Ranger. The Mature imprint Heroes Between the Sheets is no longer available in the scratch-n-sniff variant. Edit: It was never available in a scratch-n-sniff variant. Edit 2: It was never available at all. I AM expecting Vigilante support in this as well. Plus multitudes of eyes watching from the alleys and shadows. ...isn't this coming out well before Ultimate Intrigue? Seven months before Ultimate Intrigue is released? I take it there's a lot of monologuing, nefarious mustache twirling, then a complete collapse all your grandest plans followed by diving out the escape hatch? Pushed back again?! The hells!!!?? I fully expect this NOT to come out on september 30th. Only product that has not been updated. No product description update either. Or, as I like to call it, Saturday night. I am sure they will update it before subscriptions ship. You expect them to push the sole September Player Companion from September into October, when 2 such books are already planned for that month? Based on past patterns, I think it is far more likely that the 2nd October release will get pushed into November. If they are going to delay Heroes of the Streets, they would have to move 2 Player Companions from their currently scheduled months to the following months before this Thursday (when the monthly order spawning starts). I hope you´re right. But the fact that we don´t have an actual cover or updated description speaks against it. Would´nt be the first time that no Players Companion comes out in a month. I think it already was the case in february. I guess we´ll know more tonight. But the most important thing is that the product turns out good. I don´t need a Player Companion that is mostly worthless every month. But since Owen has taken over that seems to have changed - last/this month´s Dirty Tactics Toolbox is real good -the first one since Melee Tactics Toolbox. I am obviously pleased you're enjoying the line! Good work needs to be recognized. One can see that you ask people what they want and then manage to transport that into the final book. So what is up with this product again? Great cover – Jirelle rocks the crowds! And it's just showing up in my September order authorization mail, too. Probably useful for a Hell's Rebels campaign. Probably useful for a Hell's Rebels campaign. Zounds, you may be right! Can I expect more Calistria support in this book? the whole 'Optional subdomains focused on city life and urban challenges, opening up unique powers and expertise to clerics and inquisitors.' seems to suggest that it is possible. Nice cover, I hope the swashbuckler will get some love. Is there any chance that the occult classes will get anything in this book? No, Occult Origins is the first PC book that comes out late enough that we could get nearly-finished rules into the hands of our writers. It was possible, but that's not the way the subdomains went. We mention Abadar, Abraxas, Andoletta, Apollyon, Arqueros, Asmodeus, Besmara, Bergelmir, Bharnarol, Brigh, Cayden Cailean, Chaldira Zuzaristan, Cyth-V’sug, Daikitsu, Dispater, Droskar, Erastil, Erecura, Eritrice, Ghlaunder, Gorum, Iomedae, Irori, Kelinahat, Kurgess, Lamashtu, Lissala, Marishi, Milani, Nethys, Norgorber, Shei, Svarozic , Torag, Trudd, Urgathoa , and Winlas, but nothing specifically for Calistria this time. One nitpick though -- Compared to her appearance in the Advanced Class Guide, doesn't Jirelle look a bit pale on this cover? Ah... it seems to me Calistria just screams urban adventures...and I am probably a little greedy for more Calistria favored options.